Does The Debt Make US Look Weak To The Rest Of The World? Oil prices have not been this low since last October 2011. Oil plunged below $90 a barrel ($89.90/bbl), down $1.95 just yesterday, on new worries about Europe’s mess and how it will slow down the global economy. Oil prices are down more than 14% in just May 2012 alone. 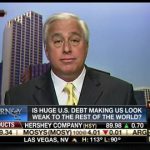 Ed Butowsky, wealth manager, financial advisor, and managing partner of Chapwood Investment Management, joins Fox News’ Your World with Neil Cavuto to discuss how the impact of falling oil prices could help boost the economy.